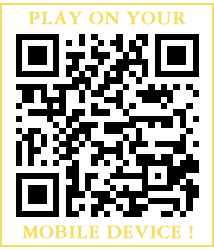 In order to play you will need to first download our software and open an account. If you choose to play for real money you must make a deposit through the JackpotCash cashier. All deposits are insured. If you just want to try the games, you can play in fun mode. Downloading our free software is quick and easy. Just follow the simple instructions below and you'll be playing in no time. Simply click the "Download Casino" button. You should then see a 'File Download' dialog box like the one shown above. Click 'Save' and continue on to step 2. 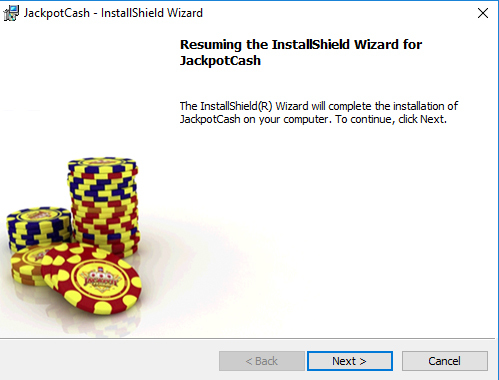 After the download is complete, return to the desktop and double click on the JackpotCash icon. Upon completion of the installation you will need to complete steps 3 and 4 in order to play for real or just for fun. Should you experience any install errors, such as a false virus threat (most likely from ESET NOD32), please deactivate your antivirus software temporarily. If the Windows firewall is turned on this may also create an error message, so de-activate that as well until the installation has been completed and you can reactivate it again once you are done. Go to your desktop and double click on the JackpotCash coin icon. 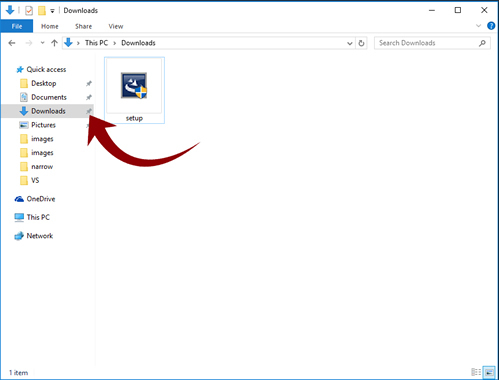 If you can't find the JackpotCash icon on your desktop, try these steps to find it. Start>Programs>JackpotCash. Double click on the JackpotCash icon. When our software appears, you must first choose CREATE AN ACCOUNT and complete the information, (Please remember our "guarantee"- all of your personal information will remain completely confidential!). Upon completing your information, choose CREATE. If you already have an account, simply press LOGIN. 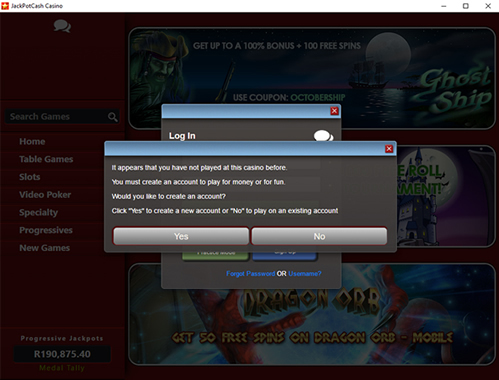 Log into the casino, but on the login screen select "Play for Fun"
Play any of the available games in our free practice mode so you may gain a feel for our games and experience the realism without making a deposit. To top up your account balance simply visit the cashier and add free virtual funds to your account. Choose REAL if you want to play our casino and win real money; or choose FUN if you simply want to get a better feel for the games before you decide to play for real. Remember, when you need to make a deposit, simply visit our cashier.